While on our recent Canada & New England cruise aboard Carnival Triumph, I learned that the theme for the ship is "Great Cities". In looking at the decor throughout the ship, I might have thought it was "Around the Globe" or "The World" since the globe theme appears throughout the public areas. When you look at the names of the various public spaces, the theme does start to take shape. The two dining rooms are called London and Paris. The main show lounge is the Rome Lounge. Another entertainment venue is Club Rio Lounge. You can enjoy a drink and cigar in the Oxford Bar or perhaps curl up with your favorite book in Washington Library. Those are just a sample of the "Great Cities" represented on Carnival Triumph. Decor of a ship contributes to the overall atmosphere during your cruise experience. Modern cruise ships are brightly decorated often, with abstract art throughout the vessel. In ages gone by, the ships were decorated with exquisite wood and often times the decor was very dark. Cruise lines spend a large portion of the new ship budget bringing their vision to life. The next time you are onboard a ship, take a look at the decor and see if you can determine the ship's theme. Take some time, perhaps on one of the sea days, to walk around the ship and enjoy the various art that is displayed throughout the ship. This may open up an entirely new aspect to your cruise experience. The RMS Titanic was a British steamliner built by the White Star Line. For her time, she was the largest passenger steamship in the world. It employed the latest technology available at the time and was thought to have been "unsinkable". Unfortunately, as you know, that wasn't the case. The White Star Line chartered several ships to assist in recovery efforts following the sinking of the Titanic. Two Halifax-based ships, the MacKay-Bennett and the Minia, were part of that recovery fleet. The ships' crews recovered 328 bodies, with 209 being returned to Halifax. The badly damaged or deteriorated bodies were buried at sea. Of the 119 buried at sea, 60 were unidentified at the time and 49 remain unidentified today. The last survivor of the Titanic sinking, Millvina Dean, died on May 31, 2009, at a nursing home near Southampton, England (not far from where her and her family boarded the ill-fated ship) at the age of 97. The Maritime Museum of the Atlantic has an extensive exhibit, Titanic: The Unsinkable Ship and Halifax, which was recently updated. The exhibit has 20 artifacts and dozens of photographs, including many that had never been published or displayed before. Two well known articles in the exhibit are the only intact Titanic deck chair and the shoes of the Titanic unknown child. Consult the museum's Research Page for more Titanic information. It is possible to walk to the Maritime Musuem from the pier. It is just along the boardwalk. There is a Visitor Information Centre right next door to the museum, where you can obtain maps and other information about local attractions. Watch our Cruise Vacations pages for more photos from our cruise. This was our second visit to Halifax, Nova Scotia. During our last visit, we visited Peggy's Cove Lighthouse. If this is your first visit to Halifax, I would highly recommend you tour the lighthouse. You can get a special cancellation from the post office there. Peggy's Cove Lighthouse is a bit weathered, but it will get a new paint job in 2009. We decided to do something different this visit. Carnival offerred the Canadian Tall Ship Sailing Experience tour. We were able to experience the historic seaport from a unique perspective aboard the tall ship Silva for an approximate 1½ - hour sail. We were entertained by the Captain and crew as they shared some interesting anecdotes of Halifax Harbour. It was even possible for some hands on sailing experience. The weather was overcast with some rain as we pulled out into the harbour. The Silva has a canopy that covers a large portion of the deck, so the rain didn't bother us. As we left the dock we were able to get pictures of our ship and also the Royal Caribbean ship that was docked in Halifax. We passed by the Canadian Naval yard where there were several ships docked. It is actually a NATO port, so you never know what ships might be in the harbour. The captain pointed out several sights along the boardwalk including Casino Nova Scotia. There are other options to see Halifax from the Harbour. I know it sound strange going from one ship to another, but Halifax is best seen from the water. Following your harbour tour, you can then move inland to visit the various popular attractions. The boardwalk was our destination of choice as the rainy weather kept us from venturing too far from the ship. I'll talk about that more in another post. We decided to tour this area with the aide of a local photographer. Carnival offered the Bay of Fundy Coastal Photography tour. We boarded a mini-coach accompanied by our professional photographer guide, Lance Timmons, and headed out to photograph some of the iconic images of New Brunswick, including a Bay of Fundy beach, working fishing wharf, waterfalls, and more. This excursion took us off the beaten path and along the coast of the Bay of Fundy giving us the opportunity to photograph the breathtaking scenic beauty of this area. We had done a similar tour when in St. Thomas, USVI and enjoyed it very much. That's why we selected this tour. Our first photo stop was at the Reversing Falls. It was still high tide when we got there, so the water was flowing away from the bridge and towards the two islands across from the power plant. As you can see from the photos above, the weather was overcast, with some light rain. That didn't put a damper on our photography tour. In fact with these conditions, photography is actually better as colors pop in the softer light. We visited the Bay of Fundy twice, first at high tide and then again at low tide just before returning to our ship. The water was flowing in opposite directions on these visits. Another stop was at the Lepreau Falls (photo above). While the Rerversing Falls are the most widely known and popular, we enjoyed our visit to Lepreau Falls the most. We have seen many waterfalls in our years of cruising, each with their own character and personality. These falls have unique color due to the tannins in the water. This was an excellent location to try different photography techniques. At Dipper Harbour we had the opportunity to see an active fishing village. There were boats coming in with their lobster catches which can be purchased locally. We made another photo stop at a very unique beach. This isn't your typically white sand beach. Instead, the terrain is very rocky. Our tour ended with another stop at our original location - Reversing Falls. We were now at low tide which means the water flow had reversed from our previous visit. The best way to capture this on camera is to take a video from the same vantage point on both visits. For more pictures from the photography tour, see our Saint John - Coastal Photography album. 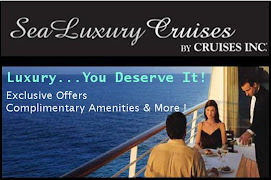 Also visit our Cruise Vacation site for this cruise (still a work in progress). Our first port of call was Saint John, New Brunswick, Canada, not to be confused with St. John's, Newfoundland and Labrador. Saint John is the largest city in the province of New Brunswick. It is situated along the north shore of the Bay of Fundy at the mouth of the Saint John River. This was the first time we visited this particular port in Atlantic Canada. While doing our research for this cruise, we learned about the Reversing Falls which is the most popular attraction in Saint John. The mighty Bay of Fundy causes the Saint John River to reverse direction twice every day and flow upstream. 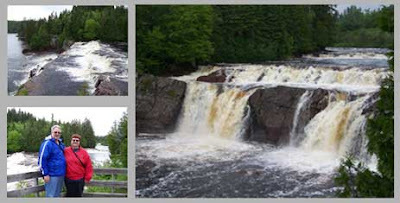 It is recommended to view the Falls twice - near low tide and near high tide. Tide charts can help you plan your visit. The pictures above on the left were taken at high tide around noon. The pictures to the right were taken around 3:30 PM at low tide. Notice that the ship was about 14 feet lower in the second set of pictures. Saint John is a port that you could tour on your own if you liked. There are tours for sale in the cruise terminal. I have to caution you that they could be sold out, however. We were booked on a Bay of Fundy Coastal Photography tour through Carnival, but we did ask about tours that were available. At that time, the only tour that was left was a San Francisco-style trolley tour . That tour is 1 hour and 15 minutes long with photo stops at the Reversing Falls Rapids, Historic Trinitiy Royal, and Fort Howe where you would be able to view your ship. There are shops in a tented building adjacent to the pier. There is a good selection of merchandise and the prices are reasonable. The nice thing is that they accept U.S. dollars, so you don't need to exchange money. The vendors we bought from provided change in U.S. dollars also. My husband has uploaded some pictures of the Carnival Triumph in the Port of Saint John. See his Saint John - Arrival / Departure photo album. We'll be posting more pictures as we continue our cruise review. Greetings from the Atlantic. We are onboard Carnival Triumph for a cruise to Canada and New England. We arrived at New York LGA airport yesterday where we then took a cab to the Manhattan Terminal. We arrived around 1 PM and by 2 PM we were onboard having some lunch. The weather in New York was gloomy and raining as we sailed out of New York Harbour. It didn't matter - it is still wonderful sailing past the Statue of Liberty. Today we are enjoying Father's Day at sea. The weather is still gloomy, but it isn't stopping us from having a good time. One of the first things we did yesterday after getting something to eat was to take the spa tour. We both booked massages including a free hot stone treatment on the back. They were offering specials during the spa tours. I'll write more later in the week. I hope all the fathers have a great Father's Day today. Hopefully you'll have a cruise vacation as a gift. If you still got the usual tie, you might want to drop a hint for your birthday or next holiday. I am pleased to give you a sneak preview of Cunard's 2011 World Voyages. Both iconic QUEEN MARY 2 and the gracious new QUEEN ELIZABETH will sail around the globe on two distinct itineraries as part of the youngest luxury fleet at sea. These epic voyages will go on sale to the public on July 1, 2009, at 5:00 a.m. PDT (8:00 a.m. EDT). QUEEN MARY 2 sets sail on a 103-day journey roundtrip from New York, bringing guests to renowned destinations around the globe in the grandest style imaginable. QUEEN ELIZABETH will define a New Golden Age of Ocean Travel as she embarks on her maiden 103-day World Cruise voyage roundtrip from Southampton. You can discover two views of the world on a special 2-Ship World Voyage option sailing aboard QUEEN ELIZABETH from New York to Sydney, then joining QUEEN MARY 2 on the westbound return journey to New York. On both ships, you will encounter a wide range of inspiring regions and maiden ports. Book early to take advantage of bonus fares. Early Booking Fares applies to reservations made before February 28, 2010. Contact me for full details and restrictions. It is also possible to book segments of the entire world voyage. Princess Cruises just announced a rare opportunity for passengers aboard all Princess ships calling in Juneau, Alaska between July 1-8, 2009. Those fortunate passengers can view a rare, original copy of the United States of America’s Declaration of Independence. A copy of this founding document will make an exclusive appearance aboard Princess Cruises’ Alaska-based ships the July 4th week, giving passengers the unique opportunity to see the only traveling copy of the Declaration of Independence. The historic exhibit will be showcased aboard all Princess ships calling in Juneau between July 1-8, 2009. This event is hosted in partnership with Declare Yourself, a non-profit organization founded by television producer Norman Lear. Passengers can be part of a historical first since this marks the first time a copy of the Declaration has visited Alaska, and the first time a cruise line has shown the famous document. The Declaration will be on display aboard the vessels for about two hours while each ship is docked in Juneau. The document will be shown aboard Diamond Princess and Star Princess on July 1; Coral Princess on July 2; Island Princess on July 3; Pacific Princess and Golden Princess on July 6, and Sapphire Princess and Sea Princess on July 8. Note: I still have cabins available for all ships except Star Princess, but they are going fast. Click on the links for more details. The only touring copy of the Declaration of Independence, Declare Yourself’s historic document is one of an estimated 200 original broadside copies (about the size of a sheet of newspaper) printed by John Dunlap in Philadelphia in 1776 after it was drafted by Thomas Jefferson, to distribute across the colonies and to King George in England. This copy’s current journey began in 1989 when a Pennsylvania shopper bought a frame at a flea market for $4.00. Later, while inspecting a tear in the back of the painting, he discovered a piece of paper wedged between the frame and painting. He pulled it out and uncovered what would soon be authenticated as the 25th remaining copy of the Declaration of Independence. The document changed hands several times and was purchased in 2000 by Lyn and Norman Lear for $8.14 million, with the goal of bringing the document directly to the American people. Declare Yourself is a national nonpartisan, nonprofit campaign that was founded in 2003 to empower and encourage every eligible 18-year-old in America to register to vote. Celebrity Cruises has teamed up with World Travel Holdings (parent company of Cruises Inc.) to offer guests an Exclusive Sale now through the end of this month. I can only share a glimpse of the offer here - you'll have to contact me for full details. Receive UP to $100 in Onboard Credit, when you book an Ocean View stateroom or higher on any MENTIONED departure. 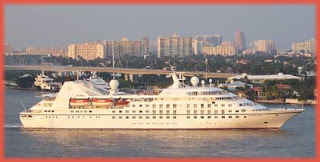 Select from certain sailings August, 2009, through January, 2010, to destinations such as Alaska, Bermuda, Caribbean, Canada & New England, Mediterannean and other parts of Europe, Panama Canal, South America, and Transatlantic voyages. Ships include some of the old favorites like Centruy, Constellation, Infinity, Mercury, Millennium, and Summit. The sale also includes select voyages on Equinox and Solstice, their newest ships. Celebrity Cruises, a premium cruise line, has one of the youngest and most innovative fleets of any major line. Since Celebrity's first sailing in 1990, it has been recognized as an industry leader, praised for providing friendly and engaging service, exotic Elemis Spa facilities, award-winning gourmet cuisine, and an overall atmosphere of easy elegance. Purchased by Royal Caribbean International in the late 1990's, Celebrity has grown its fleet significantly while maintaining its Premium niche. More information about Celebrity Cruises and Itineraries. Onboard Credit offers ($50 per stateroom – 7 – 10 night itineraries /$100 per stateroom- 11+ night itineraries) are in U.S. dollars and are not redeemable for cash. This offer is valid for NEW individual Ocean view and higher stateroom bookings, made June 1 – 30, 2009 on mentioned departures. Group bookings are not valid. THE OFFER CAN BE USED WITH CERTAIN FARES. Additional restrictions apply - contact me for full details. Book between June 16 and June 19 to take advantage of these amazing offers! This is a great time to plan a cruise for Dads and Grads. Take the entire family on a cruise vacation to Alaska, Europe, Hawaii, or other destinations that Norwegian Cruise Line sails to. Call or email me to start planning your cruise NOW. If you missed the Holland America 3-Day Sale in May, it's not too late to cash in on savings to Alaska and other Destinations. 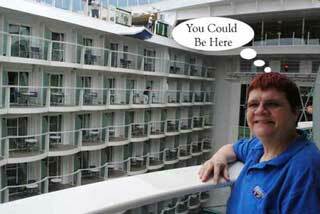 Get an outside stateroom for the price of an inside or a verandah stateroom for the price of an ocean-view! Enjoy limited-time savings on Verandah Suites! Upgrade to a Verandah Stateroom from an Ocean View from only $50 on select sailings! Plus enjoy limited-time savings on Verandah Suites! 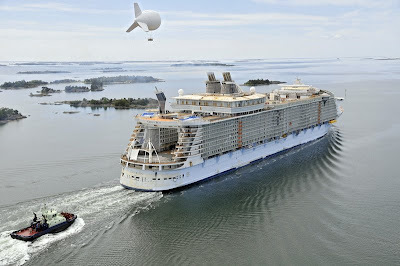 Like a "duck to water" Royal Caribbean International's latest ship, Oasis of the Seas, took to the water in Turku, Finland last week as she began the first of her sea trials. Weighing in at 225,000 GT she becomes the largest cruise ship in the world. In fact, when Oasis of the Seas leaves Turku for Miami, Fl. this autumn, it will be the biggest export product of Finland ever.It is quite an accomplishment for shipbuilder STX Europe ASA. Formely known as Aker Yards ASA, the group changed its name to STX Europe in November, 2008. Oasis of the Seas is 47 metres wide and 360 metres long, i.e. 40 m longer than the height of the Eiffel tower! Height over the water line is 65 m. Building the vessel has been compared to a huge 3-dimensional puzzle. The vessel consists of 180 grand blocks, the biggest with a size of length 22 m, width 30 m and weight 600 tons! The vessel´s weight is 12 times the weight of the Eiffel tower. It's hard to believe that it was just on November 21, 2008, that the launching ceremony of the Oasis of the Seas took place at STX Europe's shipyard in Turku. Martin Landtman, President of STX Finland Cruise Oy was joined by Richard D. Fain, Chairman and CEO of Royal Caribbean Cruises Ltd. and other executives of the yard and owners to turn the valves releasing water into the drydock and letting the vessel float out to its own element. According to Royal Caribbean's Chairman & CEO, Richard Fain, who was onhand for the event, "Most of the trials were a terrific success. The ship performed her various tests very well and everyone is very excited." The ship is now back in her construction berth. There was one surprise, however. They were thinking of adding an aerostat to the ship and were doing a test to see if it was practical/desirable. You can see the blimp in the picture above. However, if you had been there, you would have noticed that it was missing later. In fact, they had to fetch it out of the water. So, I guess it's back to the drawing board for this new innovation. Fain took it light-heartedly saying "This is precisely why we do such tests (and why I don’t take credit until we know whether or not they are successful)". Oasis of the Seas will be like a floating resort with seven neighbourhoods - themed areas offering experiences for passengers of all ages: the Promenade, a shopping mall with boutiques and restaurants, Boardwalk with the first amfi theatre at sea, Vitality Spa, Pool & Sports Zone with water park activities, Youth Zone with playing possibilities from babies to teens, Entertainment Place with casino and dance hall. And the Central Park with a revolutionary design in which the centre of the ship opens to the sky. With the length of a soccer field, some 110 metres and a width of 19 metres the park will have growing lawn, trees and other vegetation. Sun will be shining to this unique open outdoor space surrounded with restaurants, shops and cafés. Learn more about all the neighbourhoods. 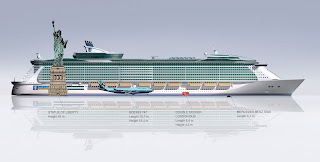 STX Europe is not just building the Oasis of the Seas, but it has also laid the keel for it's sister ship, Allure of the Seas which is due out in 2010. Perhaps this summarizes it best: "We are not building just ships, we are building experiences" says Martin Landtman, President of STX Finland Cruise Oy. "The world's largest cruise vessels are innovations themselves, and have several innovations inside. Cruise passengers are expecting new unparalleled experiences, and that is what the owners and the yard continuously are creating in good cooperation". Celebrity Cruises, a premium cruise line, has one of the youngest and most innovative fleets of any major line. Since Celebrity's first sailing in 1990, it has been recognized as an industry leader, praised for providing friendly and engaging service, exotic Elemis Spa facilities, award-winning gourmet cuisine, and an overall atmosphere of easy elegance. Purchased by Royal Caribbean International in the late 1990's, Celebrity has grown its fleet significantly while maintaining its Premium niche. Celebrity Cruises is sweeping up a slate of awards in prestigious readers’ polls and publications, most recently being named the cruise line with the highest customer satisfaction in TravelAge West magazine’s annual awards gala June 4. "We’re elated with the phenomenal response our new Celebrity Solstice and the entire fleet continue to receive for their style and design, but the most meaningful honors are those that recognize the service of our outstanding crew," said Celebrity Cruises President & CEO Dan Hanrahan. "We’re grateful to our guests and travel agent partners around the world who continue to recognize our brand in such a meaningful way." As an Elite Travel Partner with Celebrity Cruises, we can offer you an experience aboard a Celebrity ship where you become a star. Contact me for more information. Are you looking for a short getaway cruise on the West Coast for 2010-2011? Princess Cruises has the answer with short cruises ranging from an overnight cruise to a week-long journey. These “coastal” getaways offer passengers the chance to sample the Princess experience as they explore the Pacific coastline. Choose from among 18 sailings, including a special seven-day cruise to coastal wine regions with themed onboard presentations, four- and five-day samplers of Alaska and the Pacific Northwest, plus shorter sailings of one to three nights. Princess’ seasonal getaways offer an opportunity to sail on ships that are traveling along the Pacific coast to begin or end a summer of Alaska cruises. Wine Country Coastal – A seven-day cruise geared towards wine lovers, this special sailing will offer the chance to explore the California wine regions of Santa Barbara and the San Francisco area – as well as visit the microbreweries of Astoria, Oregon. Themed excursions will be available in many ports to enhance the local wine focus. In addition, onboard presentations from guest experts will showcase the world of food and wine with demonstrations, tastings and special meals. The cruise aboard Sapphire Princess will depart from Los Angeles on May 7, 2011, sailing to Vancouver with calls at Santa Barbara, San Francisco, Astoria, Seattle and Victoria. California Coastal – Sailing on a five-day journey down to California from Vancouver, Sapphire Princess will call at Victoria and San Francisco before arriving in “the city of angels,” Los Angeles. The sailing will depart on September 20, 2010. Alaska Sampler – This quick roundtrip sailing from Vancouver will give travelers a taste of the 49th state, with visits to the Alaskan ports of Juneau and Ketchikan. The five-day cruise on Coral Princess will set sail on May 10, 2010. Northwest Sampler – Royal Princess will take visitors on a four-day trip through the scenic Inside Passage with visits to Vancouver and Victoria. Sailing roundtrip from Seattle, the voyage will depart May 20, 2010. Pacific Coastal: Los Angeles/Vancouver – Passengers can relax with two full days at sea as they cruise up the Pacific coast on these three-day journeys between Los Angeles and Vancouver. Golden Princess will offer two departures on September 26, 2010 and May 11, 2011, and Coral Princess sails on September 18, 2010. Pacific Coastal: San Francisco/Vancouver – Several cruises travel between San Francisco’s legendary Golden Gate and picturesque Vancouver. Coral Princess offers a four-day sailing with calls in Astoria, Oregon and Victoria, BC on May 19, 2011. For a two-day option, Island Princess offers sailings on October 4, 2010 and May 14, 2011, while Star Princess sails on May 11, 2011. Pacific Coastal: Vancouver/Seattle – These convenient overnight sailings between Vancouver and Seattle offer the perfect opportunity for a first taste of Princess hospitality. Sapphire Princess will sail May 15, 2010 and September 19, 2010. Golden Princess will offer departures on September 25, 2010 and May 14, 2011. Royal Princess will cruise on September 13, 2010 and May 18, 2011. And Star Princess will depart on May 13, 2011. Launch Fares for overnight Coastal sailings start at $99 per person, based on double occupancy. Contact me for additional information. Have you ever dreamed about going Around the World in 80 Days? If you have, you might be disappointed to know that you'll need more time than that. It takes 108 days to sail Around the World on Seabourn's new ship, Odyssey. You can't get away for 108 days you say. No Problem !! 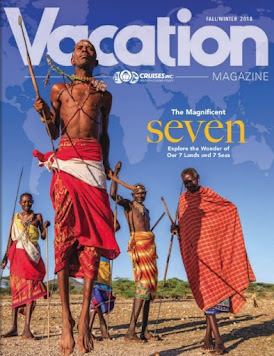 For travelers who long to leave it all behind, these 16- to 33-day World Cruise segment voyages aboard Seabourn Odyssey accommodate beautifully. You'll enjoy an extra note of excitement in the air as each maiden journey is celebrated with special festivities on board and exciting events ashore. Follow the setting sun through the Panama Canal. Venture to tantalizing edens in the South Pacific and the splendors of New Zealand. Or sail from the wonders down under to Bora Bora, Bali, Borneo and other magnificent islands in the Malay Archipelago. Or from Dubai, cruise though the Red Sea to the wonders of the ancients: Petra in Jordan, the great temples of Luxor and Karnak in Egypt, the Biblical treasures of Israel and the legends that sit atop the Acropolis in Athens. As of this writing, Seabourn is offering the following special fares and onboard credits. As always, prices are inventory controlled and subject to availability, so if you are interested in these segments, I'd suggest you contact me soon so that I can help you plan your cruise. Contact me for the most updated information regarding pricing including applicable restrictions and additional charges. 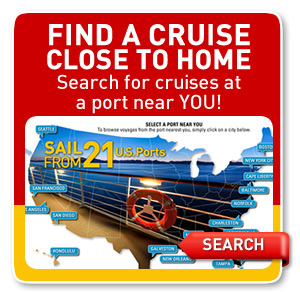 All fares are in U.S. dollars, cruise-only, per person, double occupancy, subject to availability. Some suite categories may not be available. Seabourn reserves the right to manage World Cruise segment inventory and availability at its discretion. The above savings are not combinable with any other offer, may vary by sailing date, are capacity controlled, subject to change without notice. Seabourn reserves the right to charge a fuel supplement for all guests, without prior notice, if the NYMEX oil price exceeds $70.00USD per barrel, and may collect such a supplement even if the cruise fare has been paid in full. Ships' registry: Bahamas © 2009 Seabourn. You are bombarded with constant news on the economy, the job market, housing and stock prices. Add to that, all that you deal with on a daily basis; work, family and juggling a hectic schedule. Is it any wonder why you may be feeling a little stressed? 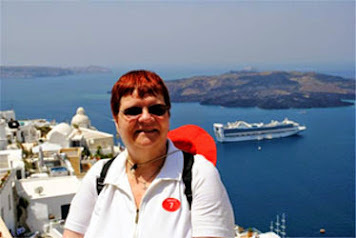 I am a CLIA certified Master Cruise Counselor with over 25 years cruise industry experience. The MCC designation means that I have made a significant investment in training and personal cruise experience that makes me the perfect resource to help plan your cruise. I am associated with Cruises Inc. and also bring the entire resources of that company to bear in assuring you of the perfect cruise vacation. In fact we offer a Best Price & Satisfaction Guarantee. 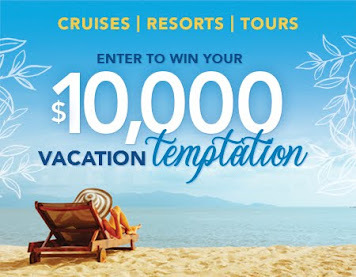 Cruises, Inc. is part of World Travel Holdings (WTH), one of the nation's largest online and offline leisure travel companies. Each year, we send millions of people around the world to warm up, cool off, explore new cultures, or just relax. You deserve to get away and save more money on a great vacation than you ever imagined – And I would like to help you find the perfect cruise just for you. I awoke today to a gloomy day which is very fitting. My thoughts immediately went to 65 years ago today when my father, and many other young Americans, were far away from home and their loved ones in Normandy, France. They were not on vacation, but rather they were in the midst of battle. It was a terrible day that many of them would not survive. The allied forces were storming the landing beaches of Omaha, Utah, Gold, and Juno. Five years ago, my husband and I had the opportunity to visit the very beach where my father had been under attack. His tank was sunk by enemy fire. Fortunately, he was rescued and lived another day to fight on to help liberate the world from the enemy. My father would not speak about D-Day, or any of the other battles he fought. He did have a chance to go back to Normandy for the 40th Anniversary. He visited the grave of his commanding officer. My father was a strong man, who rarely showed his emotions, but that visit brought tears to his eyes. With each passing year, there are less survivors alive from D-Day. 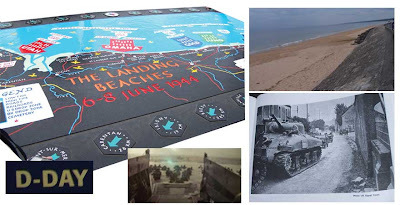 My father is one that is gone, so the only opportunity that I have to learn more about D-Day and the other battles he was in, is to visit the sites myself with a knowledgeable local guide as well as read about it in books or on the internet. As I mentioned, we had the opportunity to retrace history in 2004 when our Royal Caribbean cruise called at LeHavre, France. We hired a local guide and toured Normandy stopping at the various cemetaries, the landing beaches, and other points of interest. You can read more about our visit by clicking the "previous posts" link below. I often talk about the value that a cruise vacation offers. The obvious value comes from having a vacation that includes your accomodations, food, and entertainment in one price. An intangible value comes from the knowledge you can gain by visiting historic sites. When you dock in LeHavre, France, it is quite easy to visit Normandy. I highly suggest you include that port in one of your future cruise vacations. This year we visited Arnhem, Netherlands where we visited the Canadian Cemetary and the Liberation Museum. Again, this was while on a cruise vacation. See my Arnhem posts for more details. Oceania Cruises announced the launch of its new 2010 European Collection of Sailings in conjunction with its offer of $2,000 Price Reduction off 2 for 1 Cruise Fares with Free Airfare per stateroom on all 2010 sailings to Europe. 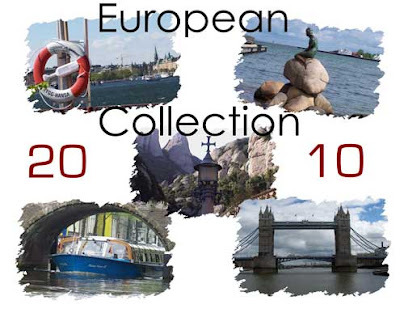 The 2010 European Collection features 34 unique itineraries sailing to more than 130 ports ranging from 10 to 36 days in length. In addition to offering guests extraordinary value, guests sailing on 2010 European Collection voyages will receive free unlimited soft drinks and bottled water. 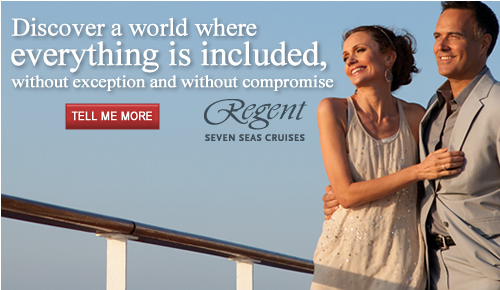 Select from sailings on Regatta, Insignia, or Nautica. Oceania has three intimate and luxurious 684 passenger ships, the Regatta, Insignia and Nautica. All three are formerly Renaissance R class ships, these mid-size ships afford incomparable luxury, including cuisine that is simply the finest at sea. With only 684 guests to pamper, the 400 staff members cater to your every whim, with highly personalized service. There's a sense of warmth and intimacy throughout, so the ambiance resembles that of a private country club - casual, yet elegant. Your European adventure can begin in one of several enchanting cities like London, Rome, Barcelona, Venice, Athens, Monte Carlo, Stockholm, Istanbul, Amsterdam, or Copenhagen. Regardless of whether you want to depart in April or December, 2010, Oceania has a European cruise vacation that you will remember for quite some time. This is Luxury you can Afford! Take advantage of this offer before cabins are gone. Just this evening I booked the last inside cabin for a client on one of the sailings aboard Regatta. Contact me for more details - I'd love to help you plan a cruise vacation to Europe. Princess® Cruises opened the bookings for Panama Canal and Coastals program for 2010-2011 starting today. In this post, I'll focus on the Panama Canal. This is one of the marvels in engineering in our world. If you've not been to the canal yet, you really should put this on your short list of cruise destinations to visit. It’s a modern wonder winding through 51 miles of jungle, mountain and granite to connect the world’s two greatest oceans —The Panama Canal. It’s also one of the most popular destinations for cruising, and is high on most travelers’ lists of the world’s “must-see” landmarks. Which is why Princess offers such a wide variety of ways to experience the Canal. In 2010 and 2011, you can join one of several incredible Princess itineraries to see its mighty locks up close. Choose voyages from10 to 19 days with either partial or full transit — or with a 2-Day Experience. Princess® showcases mankind's greatest engineering feat on voyages ranging from 10 to 19 days. Island and Coral Princess®, with over 700 balcony staterooms, are custom-built to traverse the canal, offering guests the chance to see the impressive locks of this modern marvel up close. 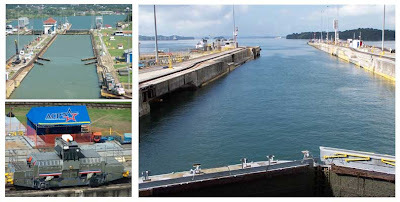 Experience at the Panama Canal, available on all itineraries of 15 to 19 days. A full transit of the Canal is combined with a full day and overnight stay at Fuerte Amador on the Pacific side — giving you time to partake of such exciting shore excursions as a ride on the Panama Canal Railway, a tour of breathtaking Soberania National Park Rainforest, a visit to an authentic Embera Indian village or a trip into the bustling capital of Panama City. It’s the best way to experience both the Canal in all its engineering glory, and the scenic and cultural attractions of one of Central America’s most intriguing regions. Sailing roundtrip from Ft. Lauderdale, this is a voyage as convenient and relaxing as it is wondrous. Your host is the lovely Island Princess,® a ship custom built for visiting the canal. Pass through the incredible Gatun Locks, where you’ll see the Canal in operation first-hand, and on to beautiful Gatun Lake. You’ll also enjoy islands in the turquoise Caribbean and a call in Costa Rica. Enjoy the Canal as it was meant to be experienced by those who built it — with a full transit between the Atlantic and Pacific oceans. Sail between Ft. Lauderdale and Acapulco, visiting ports in the Caribbean, the Mexican Riviera and Central America including Jamaica’s wonderful Ocho Rios — home to the spectacular Dunn’s River Falls — Costa Rica’s Puntarenas, San Juan del Sur in Nicaragua and Huatulco, Mexico. These are the best voyages for those who wish to immerse themselves in the history of the Canal and the natural beauty of the surrounding Central American scenery. Sail from 15 to 19 days between either Los Angeles, San Francisco or Vancouver and Ft. Lauderdale, with two full days in Panama to take in all the sights. More information will be available on my Facebook Page. Make sure to become a fan so that you'll automatically get updated when I post the updates. 2010/2011 Europe Winter Sailings now open for sale! Royal Caribbean International has announced the Winter Europe program details which can be booked as of June 1st. Destinations include Spain & Canary Islands, Ultimate Mediterranean, and Egypt along with the Eastern Meditteranean. Cruises range in length from 11 nights to 18 nights. Both Independence of the Seas and Brilliance of the Seas beginning their Winter Europe programs in December, 2010. Only the Independence of the Seas continues through April, 2011. Why not consider Europe instead of the Caribbean for your Winter 2010/2011 vacation? Perhaps you can do some holiday shopping there in December. Contact me for additional details about these cruise vacations. 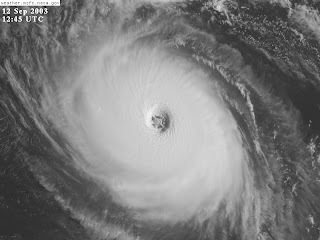 June 1st is the official start of the 2009 Hurricane season that runs through November. The National Oceanic and Atmospheric Administration (NOAA) issued its outlook for the Atlantic and E. Pacific Hurricane Season. 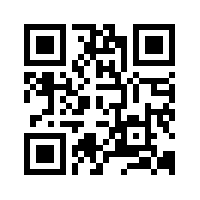 I will present highlights of the outlooks here and include links for your independent research. Every year I get several questions from clients planning a cruise during the months of June through November (ie. typical hurricane season). While NOAA and other forecasters use various scientific measures to predict the number and severity of storms for a given year, only Mother Nature knows for sure. As you'll learn as you read the rest of this article, preparedness is the key to minimizing the casualties of tropical storms. Rest assured that all CLIA Cruise Lines take every precaution to keep passengers and crew safe in all types of circumstances. The response to the recent H1N1 flu is a testament to the industry concern for health and safety of all guests and crew. I often tell my clients that I'd rather be on a cruise ship in a tropical storm than be on land. I have in fact been on many cruises during hurricane season, and will continue to do so. The ship's captains and the cruise line's home offices are in constant communication with various federal agencies, such as the NHC in Miami. In addition, modern ships have state of the art equipment and charts that provide up to the minute information that the crew can use to keep the vessel out of harms way. One consideration of course is the possibility of some rough seas and itinerary changes if your voyage happens to be in the path of a tropical storm that is forming. The cruise lines do a fantastic job, in my estimation, of dealing with the logistical issues surrounding itinerary changes. As long as you are willing to accept some deviation from your original plans, you should still have a fantastic cruise vacation, even in bad weather. Consult this figure, courtesy of NOAA, for more details about the outlook. NOAA forecasters say a near-normal Atlantic hurricane season is most likely this year. What does that mean you ask? Federal Forecasters say there is a 70 percent chance of having nine to 14 named storms, of which four to seven could become hurricanes, including one to three major hurricanes (Category 3, 4 or 5). There is some uncertainty in any outlook. According to NOAA, global weather patterns are imposing a greater uncertainty in the 2009 hurricane season outlook than in recent years. Updates are published during the hurricane season. Because of uncertainties in current predictions for El Nino, a near-normal and below-normal season are equally likely at this time. The outlook also indicates a 20% chance of an above-normal season. See NOAA definitions of above, near-, and below-normal seasons. A lack of hurricane awareness and preparation has in the past lead to major hurricane disasters. By knowing the dangers and what actions you should take, you can reduce the effects of a hurricane disaster. The 2009 Hurricane Preparedness Week was held May 24th through May 30th. If this topic is of interest to you, I encourage you to spend some time online visitng the above Web sites. There are many more links that you can explore, including historical information about hurricane disasters over the years. It is impossible to predict exactly what the 2009 hurricane season will be like. Scientists have made some great strides in predictions and warnings. As I've already mentioned, cruise lines closely monitor weather conditions and adjust their schedules accordingly. If June - November is the time you planned on taking a cruise vacation, don't change your plans out of fear. Do watch the weather reports and make sure to check with your travel agent and/or cruise line if a storm is brewing before your scheduled departure date. The cruise line will modify itineraries to keep you safe. Finally, I strongly encourage you to purchase travel insurance, so that you can be covered for any unexpected delays and itinerary deviations that result in out of pocket expenses.